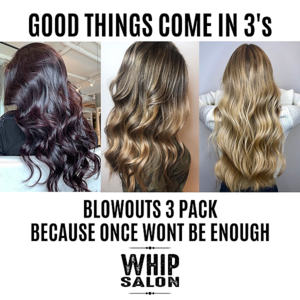 Good Things Come In Three at Whip Salon, Blowout Pack is BACK! Did you even know that Whip Salon doubles as a BLOWDRY BAR? #truestory In addition to being a full service salon we offer a Look Book of styles to match any occasion or mood. Choose from beachy waves to a chic pin-straight style. You can purchase packs or memberships through the website which makes a great gift. Open 7 days a week so you can visit us on Sunday and Monday too!